An increasing number of online bookmakers are offering betting on virtual reality sports. The first thought that would cross most people’s mind about this would be: why would I bet on something with a predetermined outcome? Surely it must be fixed in a way that is in the bookmaker’s favour? Actually, this is not the case at all, and, in many ways, virtual reality sports betting offers the easiest and fairest way of gambling on sports. How does VR Sports Betting work? From a customer’s viewpoint, they will see a series of upcoming fixtures in their chosen sport on the bookmaker’s site. Taking football as an example, there will generally be odds for full-time and half-time scores, plus various handicap options. Delving a little deeper will allow the customer to investigate the form of each team, including recent results and goals scored and conceded. From this information, an educated guess can be made about the outcome, as the program will take account of the teams’ strengths and weaknesses in determining the result. Crucially, however, the result is NOT pre-determined. Random number generators are used to ensure that neither bookmaker nor customer knows the result in advance, and neither can influence it. How do you win in Virtual Reality Gambling? The system is very similar to that for any other type of online sports betting. Bets are placed, matches take place, and wins are paid out as normal. One significant difference is that VR matches are completed much more quickly than the real thing. Although the matches can be watched as they occur, the customer is basically watching a highlights reel. They are therefore spared the agony of having to sit through all 90 minutes of a dull goalless draw! This also has the knock-on effect that many successive bets can be placed at one sitting, as the customer becomes more familiar with the league or tournament they are betting on. League seasons develop before your eyes, which makes a refreshing change for those who become frustrated during long interludes caused by bad weather and international breaks. 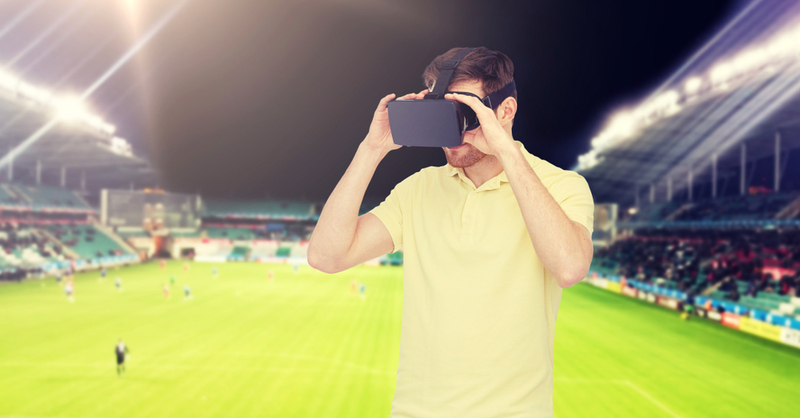 Which Sports Currently Feature in VR Sports Betting? The most popular sports, currently, are football, basketball and tennis, plus perennial favourites horse racing and greyhound racing. Some sites will also offer the other traditional US sports, baseball and American Football, and, if you search carefully, you will be able to find cycling, speedway, motor racing and even cricket. As the field develops, VR sports betting will probably cover as many sports as traditional online sports betting. What are the advantages of VR Sports Betting? As explained above, you can bet on many matches in a small space of time. Also, due to the random element, there is no chance of an outcome being ‘influenced’. For example, most traditional sports have suffered from match-fixing, or, at the very least, spot-fixing. These are not possible in the world of virtual reality gambling. A further advantage is that if a customer studies the bookmaker’s site carefully, they will have access to all of the known statistics. There is no chance of the bookmaker or other clients having access to superior ‘inside’ information. Finally, the fact that bets can be made, and matches completed, at any time of the day or night means that VR sports betting is much less restrictive than traditional online sports betting. Sports enthusiasts will find that their detailed knowledge offers them no advantage in VR sports betting. The only relevant information is that on the bookmaker’s site. Customers also need to be careful not to get too caught up in the flurry of matches and bet more than they can afford. Most online bookmakers will allow customers to set themselves loss limits to protect against this. Is VR Sports Betting Here to Stay? As the technology improves, virtual reality sports betting will become increasingly similar to the ‘real thing’. Customers will get a lot of pleasure out of betting on events at whatever time suits them. It is hard to imagine VR sports betting being a five-minute wonder. Whether it is a five billion dollar idea remains to be seen, but making sports betting this easy could certainly be very lucrative. If you are fed up with placing losing bets on your favourite team or player, why not try the VR world where misplaced loyalty will not cost you money! Previous Post Is it necessary to specify ‘mobile’ when talking casinos in 2018? Next Post A Poker Tilt Does Not Have to Signify the End of Your Betting Career!